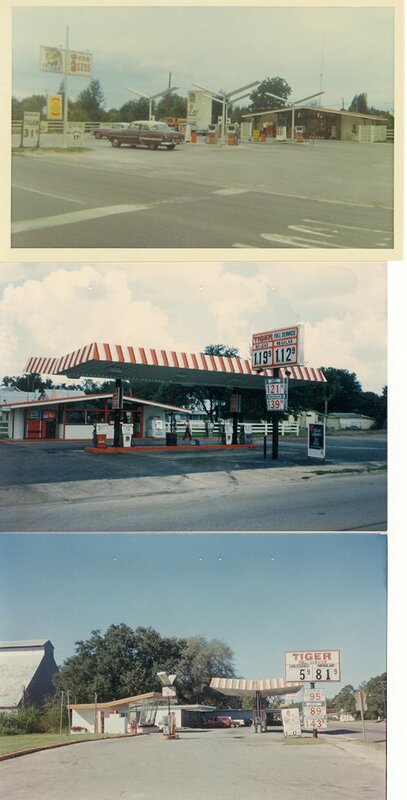 Here are three shots of TIGER stations of Carse Oil Co. of Orlando. I call this their "secondary" brand, but that isn't really right as the stations were just as good as those flying the IDEAL flag. But there were a lot less of them!! Actually, I can only remember about 4-5 and I have photos of three of them. TOP.......St. Cloud, Florida on US 192-441. June 16, 1967. For some strange reason there were two TIGER stations in St. Cloud, one on each end of town. I believe these may have been built before the first IDEAL station. And maybe by someone else, who later sold them to Carse. But that is just speculation. Nice looking "ranch" style station with outside storage tank and the common double arm signage. Again, I am quite sure the signs were painted wood or metal, like many in Florida were using at the time. MIDDLE......Here is the "other" St. Cloud station some 18 years later. This one was the one on the south end of town and the photo was taken Sept. 8, 1985. The ranch building remains, but now has a striped canopy and plastic composite sign. Also a big jump in price from 31.9¢ to $112.9!!!! BOTTOM........Williston, Florida on U.S. 27 south. November 8, 1986. This one was an old SUPERTEST which may or may not have belonged to the Hughey Companies at a later date before it became a TIGER. Price has gone back down to 81.9¢. I don't know of any collectibles from this very small brand.